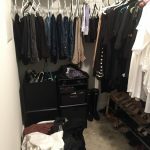 One thing I experience with clients is how difficult it is for women to clean out their closets. The “what if” questions take over and instead of living in the present they are living in the past. What if I were 10 pounds thinner? What if it comes back in style? What if my kids want it when they are older? As you age it becomes more difficult to admit what worked in the past doesn’t work in the present. 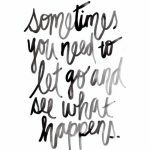 Letting go is not easy even when it comes to clothes. Clothing and shoe clutter can easily spin out of control. If you don’t get rid of old items as new items are purchased everything accumulates. You cannot see what you own and you buy more. Most don’t know where to begin so they avoid the dreaded clean out. Are you ready to clear the clutter in your closet? These tips will help motivate you to begin. 1. Before starting the project make sure you have a closet system that fits your needs. You can start from scratch by going to a home improvement store or use a professional closet company that will measure and install your new system. 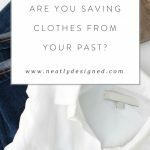 Now is the time to decide what is not working in your closet and fix it. Make a list of what you need before you begin and have the items on site so you can complete the project. 2. Try to make it enjoyable by playing music. Sounds silly but it really makes the process much easier. 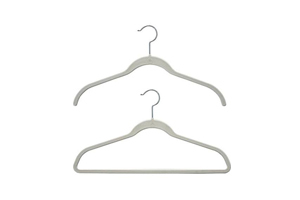 Mismatched hangers take up space and look unorganized. It’s a simple inexpensive solution with immediate results. These are my favorite hangers. 4. Have a bag for garbage and one for items you want to donate. If you are interested in selling your items make sure you have the time to commit to selling each item. You don’t want to end up with a pile of clothes in the corner of your bedroom that you had good intentions of selling but never had the time. If you have to think about an item too long and attach too many reasons why you should keep it, get rid of it! 5. Enlist the help of an organized friend or a professional. It will help you make the decisions you are unable to make for yourself. I know it sounds time consuming but it’s so important to only put back the things you absolutely love and wear. 7. Don’t get stuck on one item or the process will go slowly. If you can’t decide on something put it aside and try it on later. If an item needs to be mended or altered put it in your car to ensure it gets done. Before placing any item back into the closet vacuum the dust bunnies that have accumulated and damp clean all the shelves. A fresh coat of white paint always makes a closet look brand new. 9. Hang like items together by color. I know that may sound extreme to some people but if you color code your clothes you will know exactly what you have and what you need to complete your wardrobe. 10. Shoes and accessories should be done last. As an organizer I find that there is usually a monetary value associated with shoes and purses. I often hear clients say “I can’t get rid of those shoes, I paid a lot of money for them” my response “do you wear them?” The answer is usually no! Don’t keep something just because you paid a lot of money for it. If you don’t wear it let it go! There are many options to organize your shoes depending on closet space. Clear labeled shoe boxes are an option especially for out of season or seldom worn shoes. If you are short on space use the back of a door using a hanging shoe organizer or space under the bed for storing boots or sweaters. Clutches and smaller bags can be stored in labeled boxes, clear containers or on a shelf with a clear shelf divider. Larger bags can be organized on shelves or hung on hooks. Whatever helps you stay organized is the system you need to implement. What works for one person may not work for another. There is no one method just the one that works for you. These tips will help you stay clutter free and enjoy the things you really love. If any of these tips help in any way I would love to hear from you. Thank you! I was just going to ask what hangers are best…now I know!